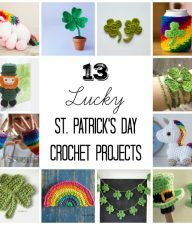 The season of crochet is upon us! There’s something about colder weather that brings out the yarn and hook and I start to crochet up a storm. I’m also starting to think about holiday decor, especially for the December season. 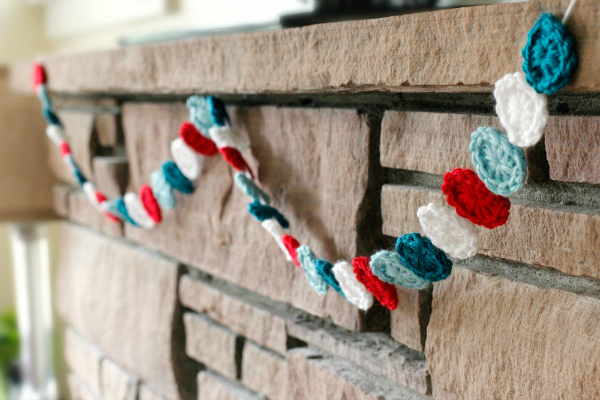 In comes a fun crochet holiday garland for the holidays. 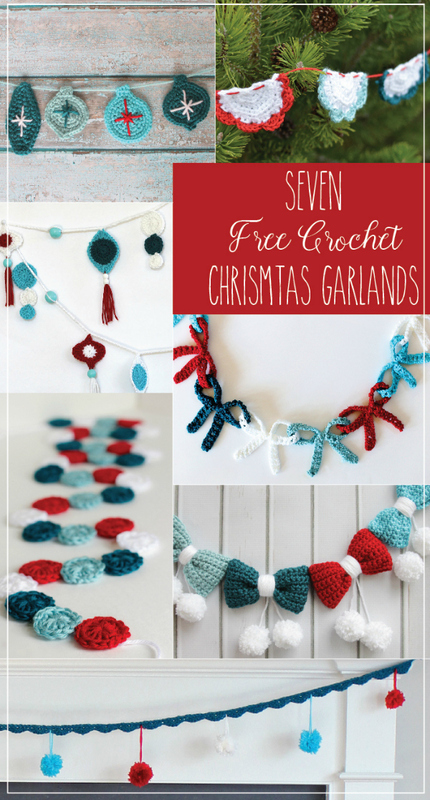 I’ve partnered with 6 other blogs to come up with a total of 7 FREE patterns for holiday garlands!! 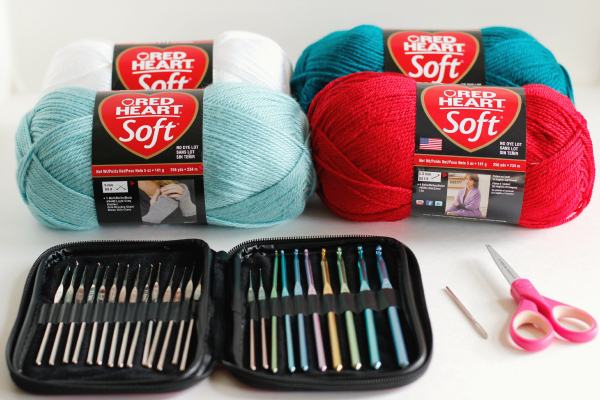 Thanks to Simplicity for sending us our fun colors of Red Heart yarn and a super cool crochet hook set from Boye to complete each project. Head over to check them all out! 2. Slip stitch through the first stitch so it forms a circle. Chain 3 more stitches (this will act as your first “double crochet” stitch in the circle). 3. Double crochet 11 more stitches in the center of the circle – for a total of 12. 4. Slip stitch through the first chain of 3 in the top 3rd stitch to complete the round. 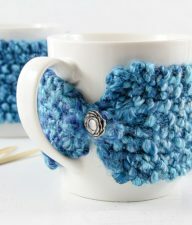 Cut your yarn and thread it through to tie it off. 5. 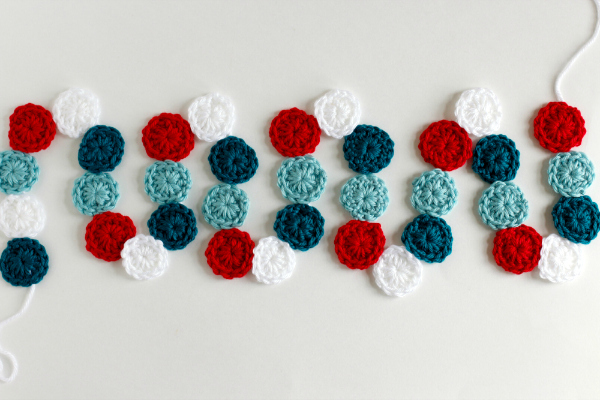 Use your crochet needle to hide both of your tails into your circle. TIP: I like to thread my tails through the center of the ring to help give it a more tight look. 6. Repeat this for a total of 36 circles – 9 of each color. You can make your garland longer or shorter depending on what your area needs for the length. 1. Choose a color of yarn you’d like to use as your string. I chose white as it’s very basic and I didn’t want a dark color to show through the white circles. 2. Thread your crochet needle with your yarn. 3. 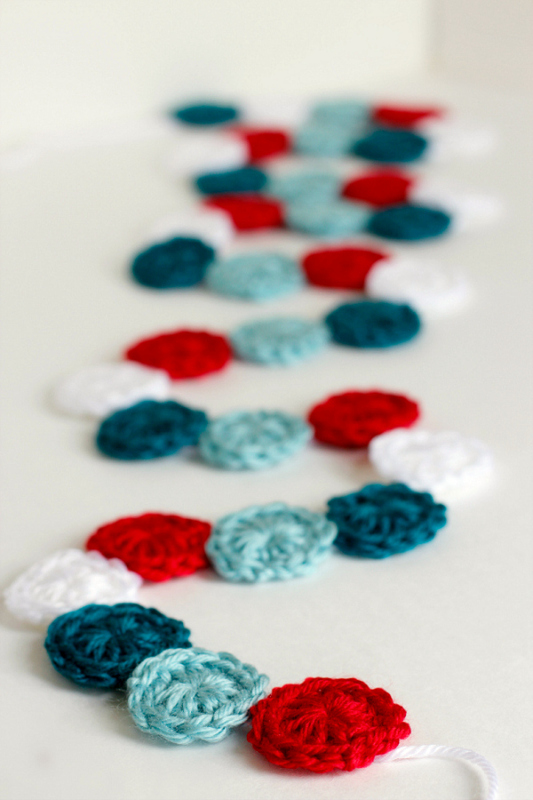 Thread your needle with yarn through each circle, stringing them along down the yarn. These circles have a front and back look to them, so decide which side you’ll put your string to make them look uniform. 4. Leave 12 inches or so on either end of the garland to help display your garland. No need to tie a knot, the circles should stay in place on the line. You did it! It’s ready to hang. You can place under your mantle or you can even hang it on a doorway for a fun holiday decor. I used a bit of holiday washi tape to hang my garland for a festive look! Slip stitch through the first stitch so it forms a circle. Chain 3 more stitches (this will act as your first “double crochet” stitch in the circle). Double crochet 11 more stitches in the center of the circle – for a total of 12. Slip stitch through the first chain of 3 in the top 3rd stitch to complete the round. 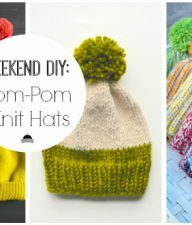 Cut your yarn and thread it through to tie it off. 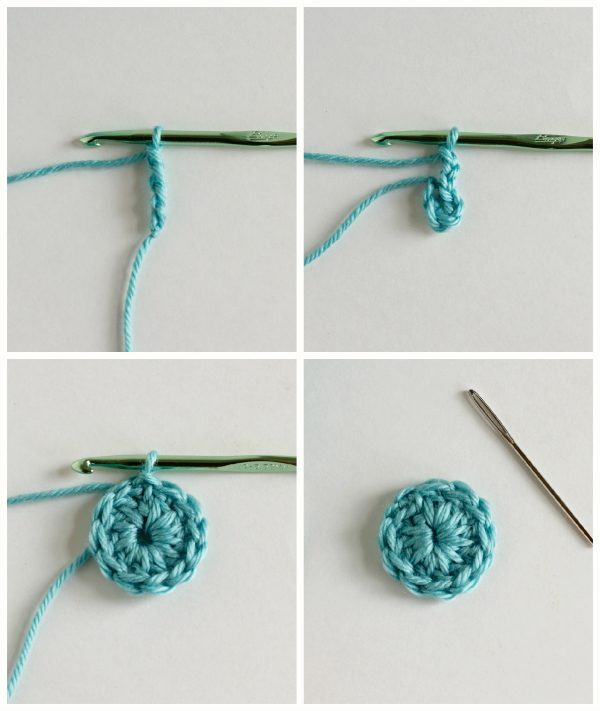 Use your crochet needle to hide both of your tails into your circle. TIP: I like to thread my tails through the center of the ring to help give it a more tight look. Repeat this for a total of 36 circles – 9 of each color. 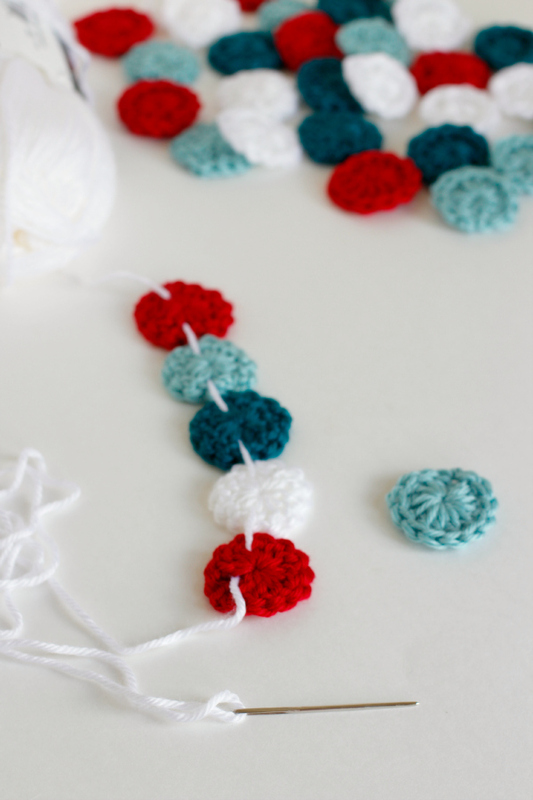 You can make your garland longer or shorter depending on what your area needs for the length. Choose a color of yarn you’d like to use as your string. I chose white as it’s very basic and I didn’t want a dark color to show through the white circles. 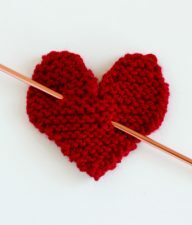 Thread your crochet needle with your yarn. 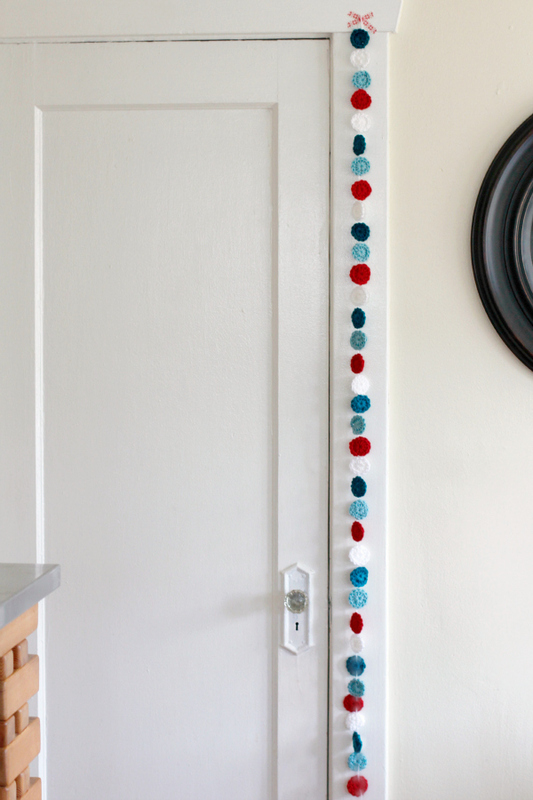 Thread your needle with yarn through each circle, stringing them along down the yarn. These circles have a front and back look to them, so decide which side you’ll put your string to make them look uniform. Leave 12 inches or so on either end of the garland to help display your garland. No need to tie a knot, the circles should stay in place on the line.